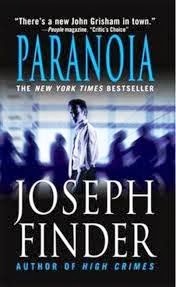 Years ago I had purchased a print copy of Paranoia and it sat on my shelf unread. When I moved a couple years ago, it was one of the many books that I ended up donating to my office. I hadn't been sure when or if I would ever get to it--and my interest in it just wasn't there anymore. Then, a couple of months ago, I saw a teaser for the movie version of the book and thought maybe listening to the audiobook was the way to go. The novel is narrated by Scott Brick, who evidently has a very good reputation as a reader. And sure enough, I was caught in his spell. Paranoia is written in first person, and Scott Brick takes on the role of the protagonist, Adam Cassidy, a man who doesn't have much ambition other than figuring out how to coast without having to work too hard. He doesn't have a good relationship with his father, a bitter man who was been burned by the system. It doesn't help matters that his father's attitude has created so many problems with keeping nurses and health aides at his side. Adam gets caught stealing money from the company he works for, a prank really, and suddenly his life takes an entirely different turn. His boss won't press criminal charges on the condition Adam goes undercover at a rival company and steals their latest plans for a new project they have been working on. Adam sees no alternative and accepts the deal. I admit I expected a more fast paced thriller. Paranoia wasn't that. It takes time for Adam to insinuate himself into the company and I never quite felt the tension I would have expected with a novel like this. That isn't to say I didn't enjoy the novel. I did very much. Perhaps it didn't help that my listening time was divided up in 20-25 minute increments over the course of two weeks. I really came to like Adam, even despite his behavior. His character grew over the course of the book, and I think that really made a difference. I could relate in some respects with Adam and his relationship with his father. His father was a difficult man whom Adam could never seem to please. I was drawn to Goddard, the CEO of Trion, in much the same way Adam was. I think my favorite character though was Antoine, the aide Adam finally hired for his father. I kind of wish he would have played more of a role in the novel, but just because I liked him so much. Wyatt, on the other hand, the CEO of the company Adam was spying for, I couldn't stand. He was everything I despise in a person: dishonest, cocky, greedy, and just plain slimy. The author, Joseph Finder, really knows now to spin a tale, drawing the reader in and getting them attached to the characters. His characters are well fleshed out. The last hour of the book was seat of your pants type listening as everything came to a head. I was quite impressed with the twists and turns in this novel, expecting some but definitely not others. As with most thrillers, suspension of disbelief is required, and I had no problem setting aside my disbelief for the sake of this novel. It's corporate espionage at its finest. Scott Brick captured the voice of Adam quite while, I thought, really making the story come to life for me. I will definitely look for more books narrated by him. And I imagine I will be reading more by Joseph Finder as well. I was really curious how the book would be translated into a film, pretty sure changes would be made to make it more of an action thriller than the book was and I was right. The movie definitely had a more intense feel to it. As can be expected when a book is translated into a movie, the movie was different in several respects. Certain aspects of the story were changed; characters were combined, similar in name only, or completely left out; and the endings are very different from one another. The movie has gotten poor reviews, and, to some degree, I can see why. The movie stars quite a few big names, including Harrison Ford, Gary Oldman and Liam Hemsworth. They all put on decent performances, but they weren't great. Liam Hemsworth was nice to look, but his character in the movie didn't stand out. None of the characters did, really. I thought the movie's story had its strong points, but it was weak in other areas. In today's day and age, given the technological advances and the high stakes involved, everything fell into place a little too easily. At least in the book, the author was able to make me believe the story he created could happen while I was reading it. It is impossible for me not to make comparisons between the book and movie. Adam's father in the movie was played by Richard Dreyfuss, a wise and fatherly figure who is not only supportive of his son but an all around nice guy. He was nothing like Adam's father in the book. Adam's father in the novel was difficult to say the least. He was extremely critical of Adam. He went through nurses and home aides like they were potato chips. Adam's relationship with his father plays a big part in the Adam's motivations in the book, and that alone makes the two versions of Paranoia very different from one another. I actually appreciate the book much more after having seen the movie. Not because the movie compliments the book, but rather because I can better see nuances of plot and characterization I overlooked while listening to the book. Joseph Finder was subtle in his approach as he weaved together his story. And by the end, I was surprised by some of the twists I hadn't seen coming. Which makes me glad I didn't see the movie first. The movie trailer itself gives away some of the book's surprises, unfortunately. As for the different endings . . . I actually liked both. The movie ending fit the movie and the book's ending was fitting for the book. I don't think I would change either. You can learn more about Joseph Finder and his books on the author's website. For more information about the narrator, Scott Brick, and his work, visit his website. Scott Brick is a great narrator but it sounds like this isn't quite the page turner it could have been. Kathy - I really liked Scott Brick and want to listen to more of his work. But, yeah, this one wasn't quite as suspenseful as I was hoping. And here was me thinking I was the only one who had ever bought a book only to give it away unread and then bought another copy at a later date. I read that book from that one website that sends you a few pages a day. I really enjoyed it. I just saw the commercial the other day & was pretty excited to see the movie. Since I read it at that free site, I was surprised to see it get picked up for a movie. That is a bit disappointing about the dad in the movie, the mean dad really made the story. It totally explained so many things about motivation, etc. Ginny - I felt that way about the dad too, and was sad they decided to make the change for the movie. I was able to hear Finder talk about the movie last October at Bouchercon. I know he was psyched about it and it's too bad the movie failed so big. I was looking forward to it. Stacy - I hope he wasn't too disappointed. Do you know if he'd seen the end product before you heard him speak?